Samsung's new VR headset, the Samsung Gear VR, comes with its own controller. Does this make the platform more interesting now? Is it even worth investing in VR at this point? It seems some technical aspects need a bit of work, but the basic stuff already looks really good. The Gear VR headset and its controller together cost around $130, the controller alone costs just under $40. In the box, you get the Gear VR (obviously) but also the controller. You also get a set of two AAA batteries, which are required for it to work. To use the Gear VR, you'll need a compatible smartphone. The ones that are currently compatible are: Samsung Galaxy S8 / S8+ / S7 / S7 Edge / S6 / S6 Edge / S6 Edge+ and the Note 5. For this review, we used the S7 and the S8. What makes the Gear VR headset special is that it's more than just a set of VR goggles: it also has acceleration and position sensors. It must be connected to a smartphone using a USB type-C or micro-USB cable (both can be used thanks to a removable component). When you first connect the smartphone to the Gear VR headset, it will install the Oculus system, which is required for it to work. Once that's done, you'll then have to unplug it and download around 100 MB of data, including the driver and the Oculus Store. It's worth mentioning that you don't have much choice in this matter as the Oculus Store contains all the apps and games that are compatible with the headset. The controller can be linked quickly and easily to the smartphone through Bluetooth and help from the Oculus assistant. I also had to calibrate the controller the first time I used it. This VR headset not only benefits from a good build and design, but it's also very comfortable. The device weighs around 500 grams (with smartphone inserted), which is actually pretty decent, and is particularly useful if you tend to have long gaming sessions. You can configure sharpness of the images using a little wheel on the headset, but to keep the image clear, don't forget to clean the lenses after each use. The light emitted from the smartphone isn't completely hidden by the edges, which might bother some users. you might be able to minimize this by tightening the headset but in the long term, that might get annoying. Don't expect anything sensational in terms of graphics from current Gear VR headsets. You can actually see the image matrix on the smartphone screen due to the magnification by the lenses, the mosquito net effect unfortunately can't be avoided. This effect can also be seen on more expensive VR systems like the HTC Vive, though it's less obvious on the latter. The pixel density needs to be much higher to get an actual good image quality, which is currently just not possible on mobile devices. To try out the game play on the Gear VR, I dived into several games and VR apps. Last year, I wrote an article where I said that tactile use with the VR headset was really annoying, so does the controller make things better? The answer is simple: yes! Granted, the VR version of Hitman GO isn't quite adapted to using a controller, but overall, using a controller provides a generally more comfortable user experience. While not all games are ready to be used with a controller just yet, some are, like Wands. This game transports you back to London in the 1880s, a city where magicians were going head to head and competing against each other. Thanks to the controller, you can interact with the game quite intuitively as the controller is actually visible in your field of vision. Samsung's controller has an extra advantage over Google's controller: it fits really nicely in your hand. The main button is really useful and the Home and Back buttons are easily accessible for your fingers. However, the controller isn't really able to accurately track location. You'd need a much more developed system to do this, which is what the HTC Vive offers. So you might occasionally have to adjust the controller during your game, which you can do by long pressing the home button. Some games work without controller, like Land's End. The creators of Monument Valley offer a games that allows you to discover VR, the graphics are really good and the landscape is sublime. You also get a realistic effect of altitude in this game, which can be terrifying. In the Oculus Store, you'll find over 600 VR apps. Some are free but for most of them, you'll have to pay, especially for games. The store also includes apps like Netflix and Paint VR, which you can actually see in 360°, either using specific apps or through Facebook or other services. If you have a Netflix subscription, you'll be able to watch films in VR but it's worth noting that the lack of image sharpness can be disappointing. You'll be able to watch your films on the big screen like at the cinema, but you can forget about Full HD. One thing is clear, the answer to the question "is the Gear VR device useful" is a resounding "it depends". If you're looking for the most virtual experience possible, you'll probably be disappointed. But that said, even VR platforms that use a PC don't offer the ultimate experience either. Aside from this, the Gear VR experience is really good: when a shark suddenly appears right in front of you, you WILL jump a mile into the air. What matters isn't really the screen definition but rather the user experience on the whole. The Gear VR will inevitably blow your mind. Last year, the S7 and S7 Edge got their own Gear VR model - the Gear VR R322. The new model number is R324. is it worth getting the new model if you already have the old one? The new Gear VR headset does have a construction issue. On the old model, the protective casing that you put over the smartphone once it's in the device simply attaches to the end of the headset. 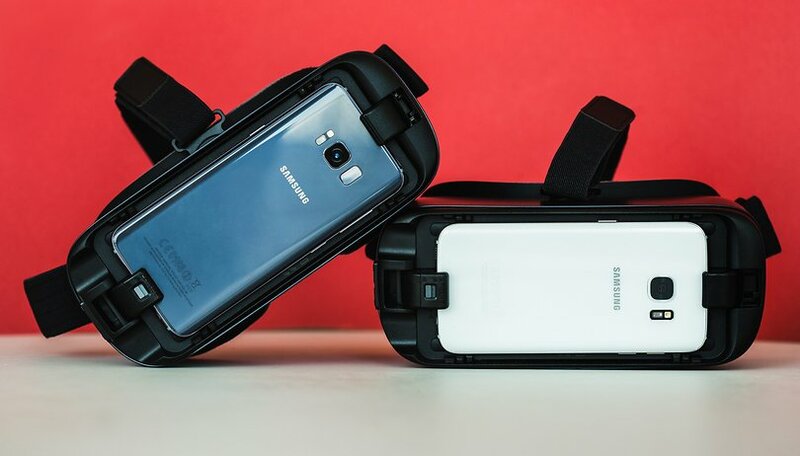 In the new Gear VR model, this protective casing is mainly adapted for Samsung's bigger smartphones. So basically, if you use an S7 or an S8, you'll have to adapt it so that you can close the casing. The field of vision is better on the new model: we've gone from 96 degrees to 101. Practically, this doesn't make a huge difference but I'm sure VR fans will appreciate it nonetheless. Whether you use the Galaxy S7 or S8, the performance was pretty good. Both smartphones were perfectly able to display all the games on the screen without showing signs of slowing down or other weakness. The VR effect, so the representation of a virtual world, was done really well and turns out to be really impressive. The sensors placed within the headset mean that the latency between the motion and the image is extremely short - there is no lag. The controller on this Gear VR has made a world of difference. it only takes a few seconds of using it to realize how beneficial it is: no more irritating touchscreen, the very least we can say about this controller is that it's very pleasant to use. This controller is also visible in the virtual world (so long as the app or game allows it). Regarding design and build quality, the controller leaps ahead of its Daydream competitor. Why didn't Samsung offer this controller with its first Gear VR headset? It's difficult to say but what do know is that you won't want to go back after trying it. Despite all the limitations imposed by mobile VR, this headset is nevertheless very successful. It may not revolutionize VR but it is a step in the right direction and it does offer many apps. Samsung smartphone users will love discovering VR with this device. It's not really worth updating the old Gear VR unless you're a massive fan of technology. This device is definitely Google's VR headset's biggest rival, but Samsung is leading the dance. I recently received my VR headset with controller and it's great, the 360 videos are really good (yes it's not in full HD and it can suffer from stuttering and loss of pixels around the edges or with black colour but they are minor issues which will get better with upgrades and new devices). I use the excellent S7 which can suffer from overheating when used for prolonged periods or intense usage. The apps so far have been good, though the majority are paid for, the free ones are perfectly adequate for trying out before buying the paid version. I was flying on the back of a eagle over a mountain range and it was excellent. I like to watch movies in cinema mode though again the quality decreases when expanded to cinema screen size. For the price it certainly delivers, can it be improved? Of course it can and most likely will. As more developers start making games and movies in 360 then the better the virtual experience will be. Still having problem using the controller. Seems like loads of fun but I didn't pre-order my S8 so I couldn't get the VR!I'm so jealous right now.